I bought this machine as an "unknown", looking rather peculiar with the Odhner like "block" construction, movement of the enclosed carriage with pushbuttons at the front, the copper coloured cladding, bullet shaped space age cranks in aluminium, and the lack of any indications about maker or serial number. Once I had the machine in my hands, it is clearly smaller than an contemporary Odhner, but it is very nicely made indeed. It spins effortlessly, clearing is light, backtransfer from the result to the input works absolutely effortlessly, it's really a little marvel of a machine. Once inside, there were still no clues as to the maker, but I did find a serial number stamped into the heavy cast iron base (11166). Three other things jumped out immediately - the small holes at the front and the back for a brand name or a logo and/or type plate, the fact that expecially with this quality of construction, all the molded plastic parts and the serial number, there was no way this was a one-off machine, and lastly - this is absolutely the very first time that when working on a mechanical calculator, I've had to whip out the Phillips-head screwdriver! Quality and Phillips-head screws, that tastes like Japan in the 1950s. We know pityfully little here in Europe about the Japanese range of mechanical calculators, which was both large and diverse. 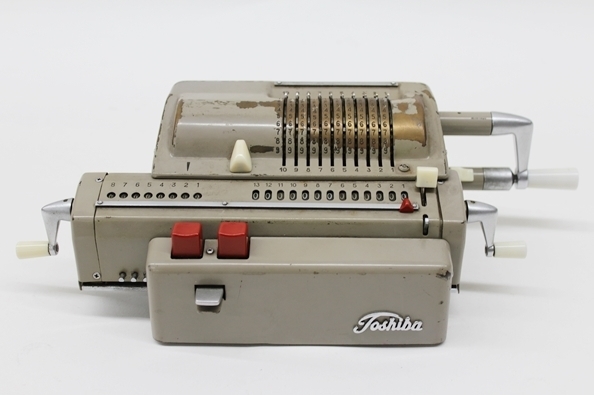 And sure enough, when looking at pictures of Japanese calculators, the Toshiba TB-20 jumped out at me ... because it had an aluminium, bullet-shaped crank. The rest of the calculator was much more traditional, but looking around for a bit on japanese auction sites quite quickly got me an image of exactly the machine that I have - the Toshiba 13-TB, complete with type plate at the back, and Toshiba logo at the front. 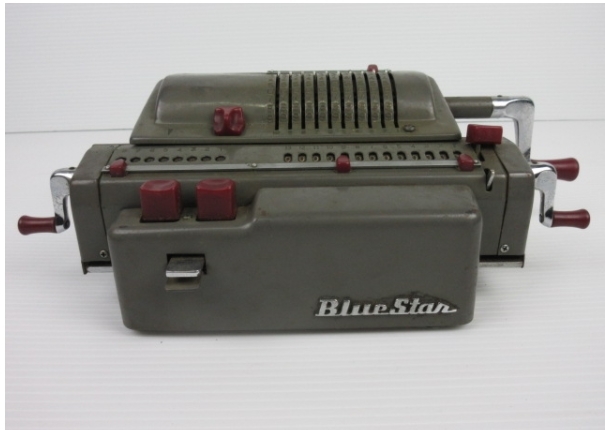 A very similar machine was sold under the Blue Star brand, but the front cover and cranks are a little different for this one.